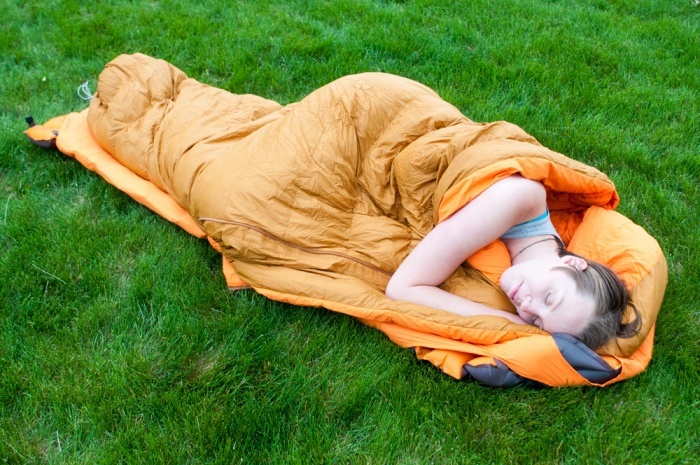 The Zenbivy is a new take on the traditional sleeping bag intended to enhance comfort for side sleepers. We put it to the test for this review. Mummy-style sleeping bags are efficient and warm. But they tend to constrict movement and limit the possible ways of lying while asleep. The Zenbivy, new this week, opens a new range of sleeping postures to those who find mummy sacks uncomfortable. Curious about the new product, I tested a pre-release model for a few nights this spring. I found the design comfortable and warm, having tested it down to its temperature rating of 25 degrees F.
The Zenbivy sits somewhere between a quilt and a mummy bag. It’s a unique product that’s a little hard to explain. The video below does a good job. Basically, a sleeping pad slides into a holder on the bottom of the product. This covers the sleeping pad with a thin, sheet-like material. This material zips onto a down quilt on each side, and the quilt can zip shut around the feet. 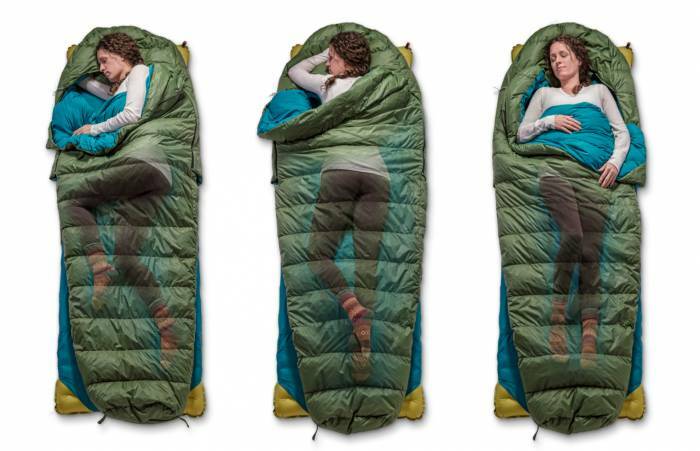 The result is a sleeping bag attached to the sleeping pad. But with a couple zips, it can be removed, becoming a stand-alone quilt, or partially attached, becoming an open bed. Ultimately, it gives the user a lot of options for sleeping positions and insulation. Zip it open, kick out a leg, and you’ll cool off. Or zip it shut and close the hood around your head to stay warm. I did that while on a float trip on the John Day River in Oregon. I slept outside and awoke surrounded by frosty grass. It was below freezing, but I slept well. I found the bed very comfortable. It allows you to side-sleep or kick out a leg without restriction. The Zenbivy is currently fundraising on Kickstarter, where you can pick one up, starting at $250. Given the 700-fill hydrophobic down used for insulation, this strikes me as a good value. The bag should work well down to its temp. rating, and well above as a quilt. 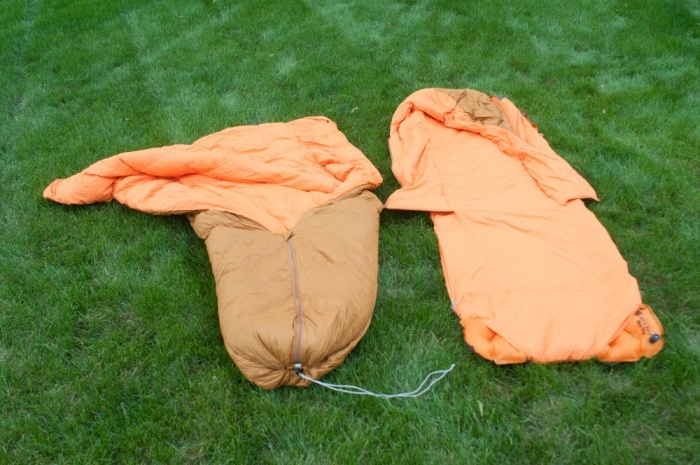 The Zenbivy is made of a removable quilt/bag, left, and pad sleeve/hood. 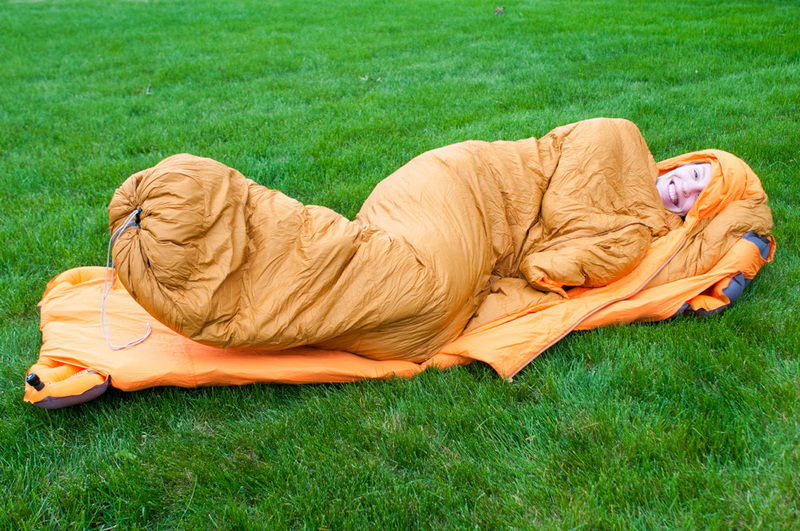 This gives the user versatility for moderate temps, or for use with a hammock as a simple quilt. The regular length I tested weighs 2 lbs., 6 oz. and compresses well. It’s a reasonable choice for backpacking or car camping. 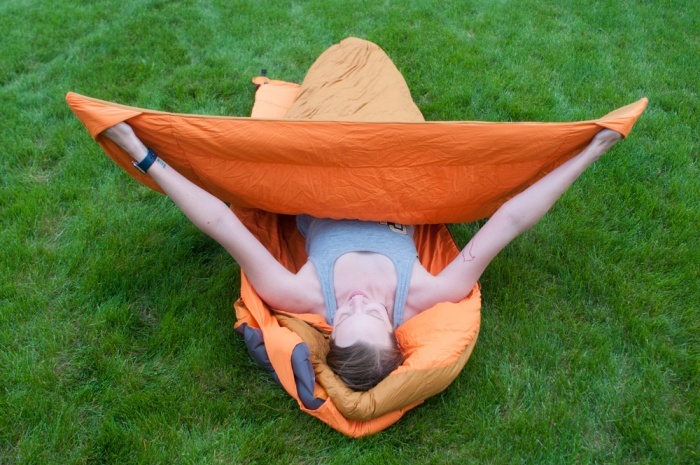 The Zenbivy requires a full-size sleeping pad. Note, a well-insulated pad will make cool weather much more comfortable. For those who feel constricted in a mummy bag or want a quilt and sleep system in one, the Zenbivy is an interesting new option. So far, it has given me some great night’s sleep.